Nishant did his Schooling from Marshall School, Dehradun. After which, he attained a B Sc Degree in Animation and an MBA in Marketing. He has since worked in several organisations such as The Shivalik Group of Publications, Florim, The WIC, Dehradun, Four Points Sheraton and The Sarovar Portico, respectively. 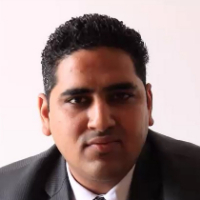 He is now working at Hotel Ramada Dehradun as their Senior Sales Manager. Sales & Marketing are two different aspects. Sales being the way, one markets a particular product, at the right price to the right person. However, marketing is how one markets that product and makes the audience aware of the same whether through strategies or otherwise. "I did my schooling from Marshall School, Dehradun. I thereafter, graduated attaining a B Sc degree in Animation from Graphics Era University in Dehradun. I then also attained an MBA Degree in Marketing from ICFAI University. I thereafter, worked for several organisations such as The Shivalik Group of Publications, Florim, The WIC, Dehradun, Four Points Sheraton and The Sarovar Portico as a part of their Sales & Marketing Teams. I am currently the Senior Sales Manager at Hotel Ramada, Dehradun since January, 2017."